Special midweek rates available when you stay 5 nights from Sunday through Thursday! Available Jan. 7 - Feb. 15 & Feb. 25 - Apr. 14. Excludes 2B & 3B units. 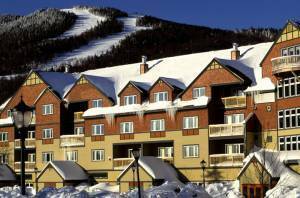 This deluxe SKI-IN / SKI-OUT hotel is located in the heart of the Jordan Bowl, and features over 200 guestrooms and suites. 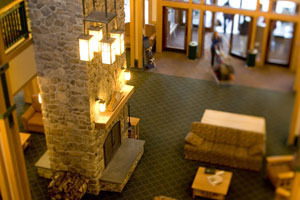 Set in the most spectacular mountain location in New England, the Jordan Grand Resort Hotel is the premier address at Sunday River. Amenities are plentiful here, including valet parking, day care, ski check, and concierge. Accommodations range from standard hotel rooms to one-bedroom suites with kitchenettes. In addition to slopeside access to Jordan Bowl, guests can enjoy the health club and outdoor heated pool. One-bedroom suites feature a separate private sleeping area in addition to a Murphy bed and/or sleeper sofa in the living room. Breakfast is included for two persons for ALL unit types. Additional breakfasts may be purchased on-site.